← The very expensive trash can. What a night Friday was for people-watching on Woodward Avenue. At the State Theater, the Tragically Hip. Across the street at Ford Field, “Battle Cry,” some sort of Christian teen thing in which people like me (that is, members of the so-called secular media) were equated with jihadists. 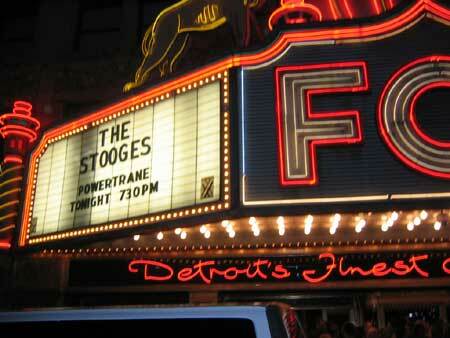 And at the Fox, Iggy and the Stooges. Alan and I sat at a window table in a bar called Proof, trying to peg which venue the passersby were heading to. The Battle Criers were easy: Pudgy teenagers in high-school sweatshirts, traveling in groups, high on life. The Tragically Hip fans were, fittingly, tragically hip. But the aging bikers towing soccer-mom wives, the young punks too cool for the room, the prosperous autoworker types and what seemed like half the journalists in town — those were Iggy’s people. We were Iggy’s people, too. Not hard-core, mind you; we were at that very moment skipping the opening act. And if you think the Tragically Hip would get me to hire a babysitter, you’re nuts. But Iggy, doing a downtown hometown show? I’m so there. I tried to powder down my suburban unhipness for the occasion, but it was hopeless, and, to be sure, absolutely unnoticeable in a crowd that was diverse in pretty much every way but racial. Alan saw a 4-year-old kid in the men’s room, sporting a fully spiked mohawk, there with his dad. There were at least two people in wheelchairs. The couple sitting next to me were young enough they felt the need to French-kiss every 90 seconds or so. A woman in the lobby showed off cell-phone pictures of her kids to a friend. “Wow, they’re so big,” the friend said. “You don’t know how old we are,” the woman replied. Well, actually we do. Iggy himself turns 60 this coming Saturday. I expect he’ll still be touring with the Stooges, doing “I Wanna Be Your Dog,” “1969” and “Real Cool Time.” For the latter, he invites a few dozen members of the audience up on the stage to mill around, sing the chorus and generally have a real cool time. This isn’t a concert review; you can follow the links for that. But hey — Viva Iggy. He’s still making music that sounds better screamed out over a bunch of bobbing heads in a venue like the Fox than it does on a CD. Fifty-nine going on 60 and he still wants to be your dog. Is it dressage…or is it dancing? UPDATE: Sorry I’m late getting to this, but I wanted to boost a couple of things out of the comments. First, Tom Watson’s newcritics take on the last Iggy bio. Ashley points out his faboo concert rider, courtesy of The Smoking Gun, our national treasure. And finally, James Burns’ Grumbles on the subject. Note, Jim: He didn’t sing “Lust for Life” Friday night. I guess it’s now been thoroughly melded to images of yuppies swimming with the dolphins on cruise lines. Don’t forget, Iggy also has the world’s funniest concert rider. And Carlos Mencia is a putz. How do you train a horse to do that? With great talent, empathy and skill. And it takes years. Iggy Pop in a washtub…that alone makes the movie great. One strike against Iggy; selling the music of “Lust for Life” to a cruise ship line. F’r christsakes! It’s about being a junkie!!! Great, Ashley, thanks for the link. I don’t know if it’s dancing or dressage, but I’ve been to some places where I thought I was observing dressage rather than dancing. By the way, did that dancing horse show up at the Iggy concert? Back to Iggy for a minute. Saw a new biography of him at Borders tonight, skimmed it, pretty much what you’d expect but if you like reading about unimaginative music and stupid behavior it oughta be quite entertaining. I’m the right age and background for it (graduated from a Midwestern high school in ’73), but I never quite got the point of whatever it is that Iggy does, or did, or according to the book used to be better at when he had the wind to keep going for extended periods onstage. Maybe if I’d found it more interesting I would have listened to enough of it to appreciate it. I suppose you have to respect the fact that he’s not dead yet, though. ashley • Tom W. • LA mary • nancy • John • James • MichaelG • basset • and YOU.